Onkyo announces three new flagship AV receivers | What Hi-Fi? 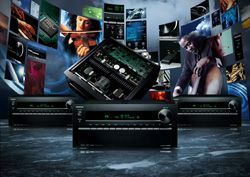 Onkyo has announced three new high-end network AV receivers to head up its 2012 home cinema range. The 9.2-channel, £3000 TX-NR5010 AV receiver leads the line, followed by the £2500 TX-NR3010 and lastly, the "value-packed", £2000 7.2 TX-NR1010 receiver. The three new products follow in the footsteps of the four previously announced AV receivers, starting at £300. All three receivers have THX Ultra2 Plus certification, the new Cisco Linksys SimpleTap feature – more on that later – and a whopping eight HDMI inputs. You'll also find an MHL (mobile high-definition link) HDMI connection on the front of the amps for connecting a smartphone or tablet. Audyssey MultEQ XT32 room equalisation is on board and you can take advantage of DTS Neo:X, Audyssey DSX and Dolby Pro Logic IIz sound processing. Mutiroom operation has been upgraded by allowing Zone2 HDMI connectivity and allowing powered audio in up to three zones simultaneously. The Onkyo remote app for Android/iPhone allows easy remote control of multiple zones of music. The top two amps, the Onkyo 5010 and 3010, both feature 11.4-channel pre-outs with DTS Neo:X 11-channel upmixing, which Onkyo claims is a world first. Also a first is the addition of Cisco's SimpleTap technology. Nobuaki Okuda, president, Onkyo Sound & Vision Corporation, said: "SimpleTap really simplifies how our new 2012 AV receivers can be connected to the network, so people can instantly enjoy their favorite tunes from music streaming services such as Spotify Premium, and many other Internet Radio services." The app gives you full control of your devices and in turn music in multiple zones from a computer or smartphone. You can see more on SimpleTap in this video by Cisco. Onkyo uses a "sophisticated digital-to-analogue conversion stage", with PLL jitter-cleaning, VLSC noise-mitigation, and TI Burr-Brown DAC modules. For video, all three models feature Onkyo’s Dual Core Video Engine, with 4K upscaling and onboard ISF (Imaging Science Foundation) video calibration. The flagship TX-NR5010 has a massive toroidal transformer supported by two discrete transformers for audio and video processing, plus gold-plated audio terminals and speaker posts. Like its slightly more powerful sibling, the TX-NR3010 also boasts multiple transformers for A/V processing, but features a heavy-duty EI transformer in place of the TX-NR5010's toroidal type. As well as the HDMI inputs, you'll find a PC input, optical and coaxial digital audio inputs, two USB ports in the front and rear to accommodate the UWF-1 Wireless LAN adapter and UBT-1 Bluetooth aptX USB adapter, which are both sold separately. You can read more about Onkyo's plans for 2012 in our blog from our visit to the HQ in Japan earlier this year.